Former captain Wasim Akram has called on Pakistani openers to seek inspiration and learn from the exploits of Indian senior batsman Sachin Tendulkar. Wasim, who is on the World Cup commentary team, also expressed his frustration over Pakistan's performance against Zimbabwe on Monday. The former fast bowler called on openers, Muhammad Hafeez and Ahmed Shahzad to learn the art of batting and building an innings from Tendulkar. The two openers have failed to provide a single decent start to the Pakistan team in five matches of the World Cup and Wasim felt both needed to rethink their approach to batting. "They should learn from Tendulkar, look at him he is 38 plus and yet he is still going strong. He just plays normal cricket in the first ten overs and does not gift his wicket," Akram said. "Tendulkar is a role model for many others and the Pakistani openers should learn from him how to build an innings and how to tackle dicey conditions. Look at Shahzad he is immensely talented but the moment the ball does a little movement he either starts shuffling across the line or moving in his crease and is gifting his wicket. Hafeez is also getting out constantly shuffling across," he explained. Wasim said the Pakistani openers need to learn from Tendulkar that even in One-day cricket one needs to build an innings. "Even if you have scored 50 odds runs in the first 12 or 15 overs and have wickets in hand you are in a good position. And Pakistan's strength is that if they have wickets in hand they can go for quick runs in the final overs," he said. He pointed out that Tendulkar was still going strong as he stuck to the basics well and didn't try anything extraordinary. "His hunger for runs is astonishing," Akram told Geo Super channel. A documentary exploring the rise of the West Indies cricket team against the backdrop of their national liberation movements of the 1970s and 1980s will be premiered in the fifth annual Tribeca/ESPN Sports Film Festival that opens in New York on April 20. Fire in Babylon, a documentary from the producers of the Oscar-winning films The Last King of Scotland and One Day in September, blends a distinctive sports narrative with music by legendary reggae artists including Bob Marley, Gregory Isaacs, and Burning Spear. Fire in Babylon is one of the six documentaries to be screened by the Tribeca/ESPN Sports Film Festival, which has become the premier showcase for independent films about sports and competition. The six documentary feature films run the gamut of sports, telling the stories of a foul ball that may have altered MLB history, a team that changed the face of cricket, an Indian boy who was born to run, a tennis pro whose transformation startled the world and one fighter's humble quest for his 12th UFC middleweight championship. Fire in Babylon is a tribute to one of the best international cricket teams in recent memory but the sport is just the starting point -- and that's why the film makes such rich and rewarding viewing, according to critics. Stevan Riley's Fire in Babylon, premiered in the London Film Festival, tells the story of the all-conquering West Indies cricket team, comprising Clive Lloyd and Vivan Richards and also several of the most lethal fast bowlers of the modern cricket era. In his documentary, Riley tells us about West Indian national pride and English colonial bad faith. The West Indies team was once termed as "calypso cricketers" and though they had excellent cricketers of great talent, the team did not win consistently. In 1975-76, the team was humbled 5-1 in a Test series against Australia that had fast bowlers Jeff Thompson and Dennis Lillee. 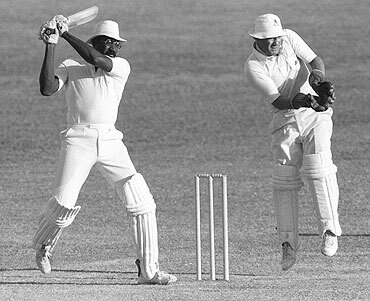 The West Indies players were part of a generation determined to prove themselves against their former colonial masters. Former captain Imran Khan is not aware of the factual position of Umar Akmal's alleged faking injury episode but said if it is true then the player should be dropped from the World Cup squad immediately and never be allowed to play for Pakistan again. Commenting on reports that Pakistani batsman Umar had faked a finger injury after reports that his brother wicketkeeper Kamran Akmal might be dropped for the game against Zimbabwe in the World Cup, Imran said he was not aware of the factual position. "But if these reports are true about any player faking an injury or showing attitude then the management and board must have no doubt on what needs to be done," he said. Imran said that the success he tasted as captain including the 1992 World Cup win was based on one simple policy. "I had made it clear to every player, the selectors and the board that in my team there was no place for anyone who was not trying hard enough for the team or who wanted to play for himself and was a selfish player," Imran recalled. "I don't know if the reports coming out of Sri Lanka are correct or not but if they are correct then such players need to be dropped from the team immediately and never be allowed to play for Pakistan again," he said. 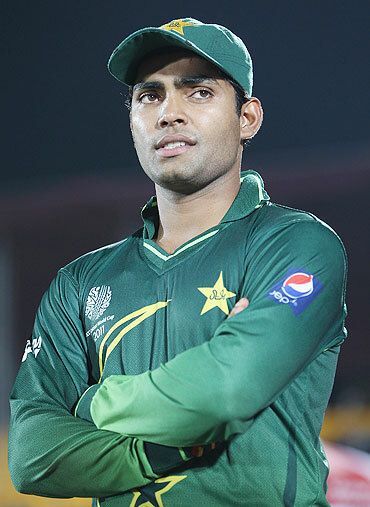 Sources in the Pakistan team said that the management while denying reports that Umar had faked his injury to avoid having to keep wickets in place of his brother had been told privately that he should be careful with his conduct and avoid getting into such controversies or his career could be short lived with the Pakistan team. England skipper Andrew Strauss and spinner Graeme Swann missed Tuesday's practice with a stomach bug but both are likely to feature in Thursday's must-win Group B match against West Indies. "They both missed practice today with a stomach virus. (We) will assess them tomorrow but certainly (it is) nothing serious," the team spokesman said in a text message. With five points from as many matches, England badly need to beat West Indies in their last group assignment and then hope South Africa defeat Bangladesh on Saturday to clear their quarter-final passage. England have already lost Kevin Pietersen (hernia) and pace bowler Stuart Broad (side strain) to injuries.